The Digital ICT report was launched in February 2016. The panel was chaired by John Healy and the vice chair was Tom Gray. The report identifies four areas – software engineering, advanced networks and sensors, data analytics and cyber security – where Northern Ireland has potentially world class strength. It then matches those strengths to particularly fast growing global markets and argues that if we have the skills and strategy correctly aligned, we can take full advantage of opportunities in areas like data analytics, machine learning, the Internet of Things and cyber security. The report highlights that Northern Ireland urgently needs a skills investment plan to identify growth areas and make sure that the right digital skills for the future are being taught. It also recommends the appointment of a Chief Digital Officer to develop and deliver a coordinated Digital Strategy and to act as a champion for the region both internally and externally. In addition, it recommends that a new centre of data analytics is established, using the smart specialisation model so successfully delivered by CSIT, the Centre for Secure Information Technologies. It also calls on government to become an expert and strategic customer when it comes to digital technology, and asks for the continued support of the cyber security sector. Some facts and figures about Northern Ireland’s Digital ICT economy. A strong local base of generalist software engineering skills supports a number of specialist strengths (Data Analytics, Cyber Security & Advanced Networking & Systems), giving Northern Ireland the opportunity to focus on key global trends which in turn help shape their output to other local business sectors. Represents 43% of the ICT sector in Northern Ireland. The foundation on which our specialisms are built, with 550 companies supported by a strong skills pipeline. CSIT in Belfast is the UK’s largest cyber security research centre. CSIT has secured over 900 jobs in the sector through FDI with support from Invest NI & UKTI. There are 22 NI businesses directly engaged in Data Analytics. 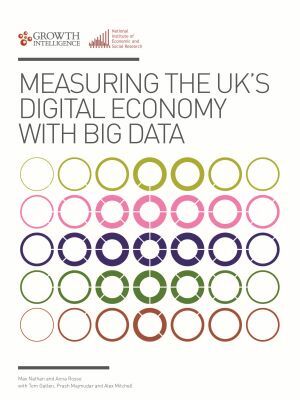 A 2015 Tech Nation report highlights Belfast as a leading data management and analytics region. There are around 20 companies engaged in advanced networking solutions R&D. The panel has identified a number of global megatrends and matched them to key skillsets where Northern Ireland has the best prospect for growth and innovation over the coming years. Demand is increasing for ICT products which help people manage their own health and wellness. There is also increased pressure for health services to find ways to improve efficiency in the delivery of healthcare. Data analytics: analysis of medical data reveals new ways to identify health risks, diagnose conditions and personalise treatment and care. Applications: wellness applications for smartphones and tablets can be tailored to the needs of an ageing population. Cyber security: medical and wellness records must be secure and trusted to be secure. Sensors: there is an opportunity for wearable sensors for diagnostic or monitoring applications. Smart city infrastructure is locally relevant, and so are the opportunities globally to export solutions to urbanisation challenges. Sensors: as cities and other locations become increasingly connected, dense sensor networks connected via data aggregation and analytics platforms to multiple applications will increasingly help manage public administration, emergency services and transport. Advanced networking: urban areas require the densest networks, and have led to the development of small cell mobile networks and heterogeneous networks (HetNets). Applications: city administrative and other government functions are being transformed through the development of online and mobile applications, in areas such as payments and information services. Cyber security: as more critical data runs over city networks the networks, applications and data need new approaches to security. Data analytics: aggregation of data presents an opportunity for insight and value to be created through the combination of data sets and the analysis of rich data. There is a need for the delivery of devices, networks, services and applications that support the demands of ‘digital natives’ – i.e. those whose who are fully at ease with technology. Advanced networking: Digital natives expect to interact 24×7 with guaranteed levels of responses. Networks must be resilient and high-performing to ensure service delivery. Applications: This next generation processes information more quickly, multitasking across devices. They have access to thousands of applications, transforming and pushing the development of the user experience. Cyber security: Digital natives take security for granted, expecting technology and organizations to protect their private information. The line between public and private is far more porous than for those born before the digital age. As huge volumes of personal data are exchanged, the importance of privacy, trust and security increases. Data analytics: The ability to engage proactively with digital users will be enabled through data analytics and will assist delivering localised services by anticipating demand and proactively meeting needs. Exploitation of anonymised and aggregated data offers opportunities for innovation, the development of new services and alternative revenue streams. As the capabilities of computers expand beyond routine work, tasks that were once considered too complex for automation will be converted into well-defined problems capable of digital solutions. Advanced networking: the increased capability to move large amounts of data allows business activity to take place anywhere. Applications: more sophisticated applications are replacing human activity in lower-skilled work in all sectors. However there are also major job opportunities where automation can complement and enhance human activity. Data analytics: understanding of transactional data can lead to changes in the location of business functions, from manufacturing to provision of IT services, while the automation of data analysis changes the pattern and location of business processes. Cyber security: as organisations rely increasingly on networks and cloud-based services running on virtualised infrastructure, securing data becomes more challenging. Clustering, cooperation and global niche manufacturing networks can bring market opportunities through strategic partnerships & collaborative technologies. Advanced networking: the increased capability to move large amounts of data anywhere, quickly and reliably changes where economic activity is located. Applications: more sophisticated applications are replacing human activity in lower-skilled ICT work. Data analytics: understanding of transactional data can lead to changes in the location of business functions, from manufacturing to provision of IT services; and automation of data analysis changes the pattern and location of business processes. Cyber security: as organisations rely increasingly on networks and cloud-based services running on virtualised infrastructure, securing data becomes harder. New ICT service models: the rise of cloud-based applications mean that IT services are no longer delivered from data centres close to the point of use, and sometimes from unknown locations. Looking at projected growth in global markets where Northern Ireland businesses have established strengths allowed the panel to identify the specific areas where efforts would be best focussed. Big Data Analytics IDC expects that the Big Data technology and services market will grow at a 26.4% compound annual growth rate (CAGR) to $41.5bn through 2018. Software IDC expects CAGRs of 5.1% and 5.3% for the United States and Western Europe, respectively, between 2015 and 2019. Cyber Security MarketsandMarkets expects the global cyber market to grow from $106.32bn in 2015 to $170.21bn by 2020, at a CAGR of 9.8%. Internet of Things (IoT) IDC expects the global IoT market to grow at a 17% CAGR from $698.6bn in 2015 to nearly $1.3tr in 2019. There must be a clear pathway for young people through school, enabling and inspiring them to acquire appropriate skills within the existing curriculum, generally in STEM subjects and specifically in software development. They should be offered progression routes to Apprenticeships and Further and Higher Education. At the same time, a framework of support should be made available to allow teachers to deliver the curriculum effectively. For Northern Ireland to become a truly digital society we must engage and empower a leading industry expert as RoI and other UK regions have. The appointment of a Chief Digital Officer and the development of an ICT strategy for Northern Ireland is essential. Analysis shows that countries with robust digital economies have a clear delivery strategy aligned to their programme for government. The UK Government has become a world leader in the provision of user-led Digital Transformation. Northern Ireland has the opportunity to use its skills and innovations for the benefit of its citizens, and to realise the cost savings and service improvements that other territories are benefiting from. Northern Ireland’s size and governance structures should enable it to become a global exemplar for Digital Transformation by 2020. However, it is still difficult for local suppliers to sell effectively to our public sector. Smart specialisation is an innovation policy concept designed to promote the efficient and effective use of public investment in research. The goal of smart specialisation is to boost regional innovation in order to achieve economic growth and prosperity, by enabling regions to focus on their strengths. Northern Ireland’s challenge is to focus on smart specialisation and avoid fragmentation. Private equity is going through a period of rapid change, with the emergence of new funding models such as crowd-funding and corporate venture capital and the implications of these changes for Northern Ireland are not straightforward or easily predictable. Significant progress has been made in ensuring government support is available for companies through Invest NI, InterTradeIreland, the NI Science Park and others; however there are a range of areas where improvements are still needed. HMRC offers R&D Incentives and as incentive rates have increased and the scope of the schemes has been enhanced an increasing number of NI businesses recognise and utilise the value of R&D Tax Credits, in particular. The panel identified the following characteristics that leading digital economies share and examined Northern Ireland’s performance against them. They then mapped any shortcomings to current governent activities and the remaining gaps were incorporated into the panel’s final recommendations. Northern Ireland currently has no digital strategy. MATRIX recommends the appointment of a Chief Digital Officer to develop and deliver a digital strategy for Northern Ireland. MATRIX recommends the development of a Skills Investment Plan. NI has a proven ability to attract and maintain FDI. Further opportunities for growth are being achieved through smart specialisation. BERD levels are low compared to the rest of the UK. HMRC offers financial incentives to encourage businesses to carry out inhouse R&D. Levels of business innovation are low but improving. The 2014 Innovation Strategy envisions that by 2025, NI will be recognised as an innovation hub. Take-up of funding such as Innovate UK and Horizon 2020 is low. DETI is currently developing a Northern Ireland Strategy for Horizon 2020. There is an opportunity to improve formal clustering. MATRIX recommends a centre for Data Analytics and continued focus on CSIT. Northern Ireland is one of the most connected regions in Europe. The infrastructure must be maintained to be able to support 4G, 5G and beyond. NI does not align its industry strengths alongside ICT as much as it could. DETI published its Smart Specialisation Framework in 2015 detailing strategies to deliver on innovation priorities. NI's Digital ICT brand is not as distinguishable as it could be. The role of a Chief Digital Officer could incorporate brand development for the sector. The report makes several recommendations and suggests owners and timescales for completion. 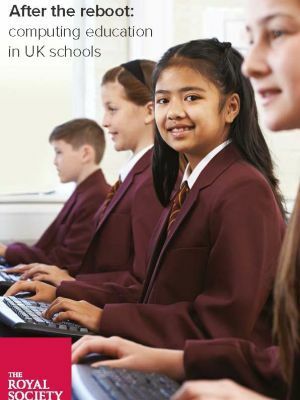 A coherent educational progression model which embeds the necessary skills from primary level onward, a framework for teacher professional development in digital skills and a clear skills investment action plan for the Digital ICT sector. 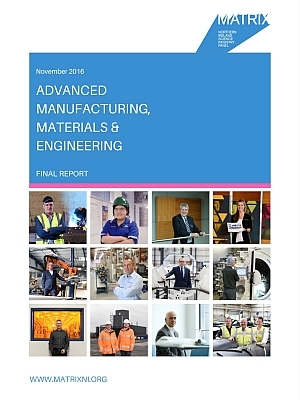 Focus the skills investment plan to support the areas examined by this report and consider ways to create the skills required in the future. Highlight within the investment plan the sector-specific requirements to attract the best talent to Northern Ireland especially in key capability areas. Carry out a feasibility exercise to establish the economic benefits that a centre for data analytics will have for innovative high technology small and medium sized enterprises (SMEs), corporate businesses, academia and government. Employ a clear leadership and governance structure to attract public sector resources that complement the private sector’s technological expertise. Create a centre for data analytics that will advance the development commercial spin-offs and new products and services for the market, by converting data into valuable market information using advanced statistical modelling techniques and advanced software solutions. Short to medium term -1 year to 18 months from the publication of this report. Commission a leading Digital industry expert to support Government to build a digital society and an exemplar region to meet the expectations of 21st century citizens. Develop and deliver a coordinated Digital Strategy to bring together the key stakeholders and initiatives required to transform Northern Ireland into a fully digitized and Smart society. Create an agile delivery process that responds to the changing requirements of purchasing of technology products and services to ensure solutions meet business requirements. Ensure that Northern Ireland has an exemplar digital infrastructure within and between urban areas resulting in Northern Ireland as an exemplar smart, connected region. Provide an integrated, agile platform, based on open standards which expose appropriate data and service APIs to nurture the development of an innovative ecosystem. The products and services created by this ecosystem will benefit both Northern Ireland citizens and the economy through exports to other Smart City environments. Make it easier for local businesses, particularly SMEs, to do business with Northern Ireland Government. Department of Finance and Personnel the Department for the Economy (DfE) and local government. Continue to support CSIT with its vision of establishing a global innovation hub for cyber security. Support the growth of the NI cyber security cluster with targeted support for start-ups, indigenous businesses and FDI in the sector. John joined Allstate NI in January 2016 as Managing Director responsible for over 2,300 employees based in Allstate NI’s three locations. He was previously head of CITI’s Belfast Service Center providing IT, operations, HR, legal, finance and risk services to the broader Citi group as one of 27 global delivery centres. In 2007, Rob brought the SQS Group into Northern Ireland, where the company has grown to over 250 staff across Ireland with a turnover in excess of €20m. Rob is also Chairman of Momentum, Northern Ireland’s Digital/ IT trade association. Sinclair is currently Executive Director of a collaborative initiative, Digital Northern Ireland 2020, which aims to maximise the economic and social benefits derived from the past, existing and future investments in Northern Ireland ‘s digital infrastructure. Neil has worked in Arthur Andersen, Rank Xerox and Compaq before joining Cisco where he worked for 14 years. His roles there included leadership of Cisco’s European solutions marketing, EMEA capital financing business, Cisco’s global business with BT and Cisco’s UK Public Sector business. Stephen is the CEO of Analytics Engines, a Belfast based company who provide solutions for accelerating software applications. He started his career with Microsoft and then the ECIT Institute before working for Accenture in the Dublin financial services sector. Commercial Director of ECIT and CSIT at Queen’s University Belfast, Stephen has overall responsibility for the research and IP portfolio. Previously Stephen was VP Licensing for APTX Ltd (acquired by CSR Plc). Canice is the Director of Information Services and the European Group Head of IT in Moy Park Ltd. He has responsibility for IT Infrastructure Services, Business Systems provision to both the operational divisions and group functions, and Software Development. Brendan has over 20 years experience in ICT and has spent the last 9 years building and developing EMC’s presence in Northern Ireland with a strong focus on Healthcare and Big Data Analytics. He previously worked for Fujitsu Services and Sun Microsystems. Michael Gould is Assistant Director of Skills & Industry Division in the Department for Employment and Learning and has responsibility for Skills Policy, Skills Delivery and Management and Leadership training in Northern Ireland. Barry Lowry is the Director for IT Shared Services and Strategy and Head of the IT Profession within the Northern Ireland Civil Service. Barry has worked in ICT within Government for more than 30 years. Gerard Parr holds the Full Chair in Telecommunications Engineering and holds a PhD in Self Stabilising Protocols. He is a Member of the DETI/DARD Broadband Improvement Project Board. David Hughes is presently Director of Curriculum, Qualifications and Standards in the Department of Education in Northern Ireland. A career civil servant, he has previously worked in the NI Department of Justice and in the Northern Ireland Office. Below is a selection of the reports we used when researching this project. If you would like to see all the IT related reports, please visit the library.